Stagecoach East Scotland have announced an investment of £2.7million for a fleet of 10 innovative new coaches improving public transport accessibility in West Fife. First of their kind, these coaches are unique in the fact that almost half the vehicle's seating is on a low level, allowing those with mobility issues and wheelchair users easier access, for complete peace of mind. The Plaxton Panther LE coach model, on a Volvo B8R LE 6x2 Chassis, was manufactured by Plaxton in conjunction with Bus Users Scotland to provide passengers with the best possible vehicle for their journeys. The vehicles still retain the level of luxury typical of Stagecoach Express coaches with leather reclining seats, free wifi access, USB charging points, air conditioning and a luggage hold. 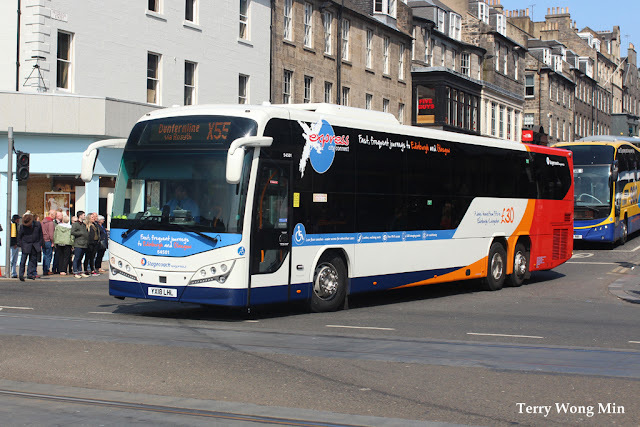 This latest venture by Stagecoach East Scotland brings the company's new fleet investment to over £5.8 million in the past year alone. Paul Thomas, Managing Director of Stagecoach East Scotland, said: “Stagecoach endeavour to remain at the forefront of transport development in the UK. This new vehicle investment demonstrates our commitment to making public transport greener and smarter, providing innovative, new vehicles and improving wheelchair accessibility on one of our routes to Edinburgh. We're delighted to have worked with Bus Users Scotland on the design of these new coaches, their unique layout provides an easier, low floor access for those with mobility issues, without comprising on the coach style luxury. I sincerely hope our customers enjoy their journey on these upgraded vehicles!" The coaches are due to be on the road in early May, with a second batch of 9 of the same coaches due later in the year for other routes in the East Scotland fleet. These coaches will form part of Stagecoach East Scotland's wider award winning Express City Connect Network. The Express City Connect network operates high-quality coach services across Fife and into Edinburgh, Perth, Dundee, Aberdeen and Glasgow. The majority of new coaches will be used on the X55 Dunfermline to Edinburgh route, offering journeys up to every 20 minutes to the Capital, serving the recently upgraded Ferrytoll P&R site. The vehicles were officially launched by the Minister for Further Education, Higher Education and Science, Shirley-Anne Somerville MSP on Monday 14 May. These innovative new coaches will also be on display at the company's Dunfermline depot open day, celebrating 100 years of the bus garage, on Saturday 19 May. “I am delighted to join Stagecoach in welcoming this great investment towards public transport accessibility in West Fife. These new accessible buses will benefit residents and visitors alike. All people with disabilities should travel with the same freedom, choice and dignity as others, and this welcome investment will have a truly positive impact for people who use wheelchairs or who have mobility issues.